I would marble just about everything in my house right now, if my husband would allow it. I've been into it for a good while. And, by into it, I mean looking at marbled objects and swooning over them. However, after creating this Marbled Paper Garland DIY for the A Subtle Revelry blog I'm afraid I'm going to have to stop swooning and actually make (way too many) marbled objects. It's way easier than I thought, my friends. I'm pretty in love with how this garland turned out. Marbling is one of those things that is very experimental. I had planned on the marbling being navy blue with a bit of pale pink and a lot of peach. The navy blue turned more cobalt/indigo in the water and the pink was much brighter. However, it's still one of my favorite garlands ever. I love how it's a more grown up garland in that it looks more like an art piece or mobile. I'm actually considering turning it into a mobile to hang in our home if I can get my act together and find a place for it. This marbled paper garland was created with nail polish. It's great because you can pretty much make it with items you already have at home versus buying fancy art supplies. However, be careful with the fumes. I was wearing a mask while creating the marbled paper. My friend, Michelle, asked if I was making meth a la Breaking Bad. Score two points for Michelle. No meth, but I do recommend a breathing mask. Want to see more photos? Seriously, you need to see the photos of the marbling. Check out the: full marbled paper garland DIY post over at A Subtle Revelry. I'm back today with an exciting announcement and a fun party DIY. I alluded to it in this Wise Words post, but I'm a new contributor for the blog, A Subtle Revelry! Victoria shares a lot of great party crafts, DIYs and food ideas. I love her descriptor: merrymaking the everyday. This collaboration is a new challenge for me as I'm often party planning and crafting at the very last possible second. Maybe it'll force me to get my act together and plan ahead more this year. Fingers crossed. 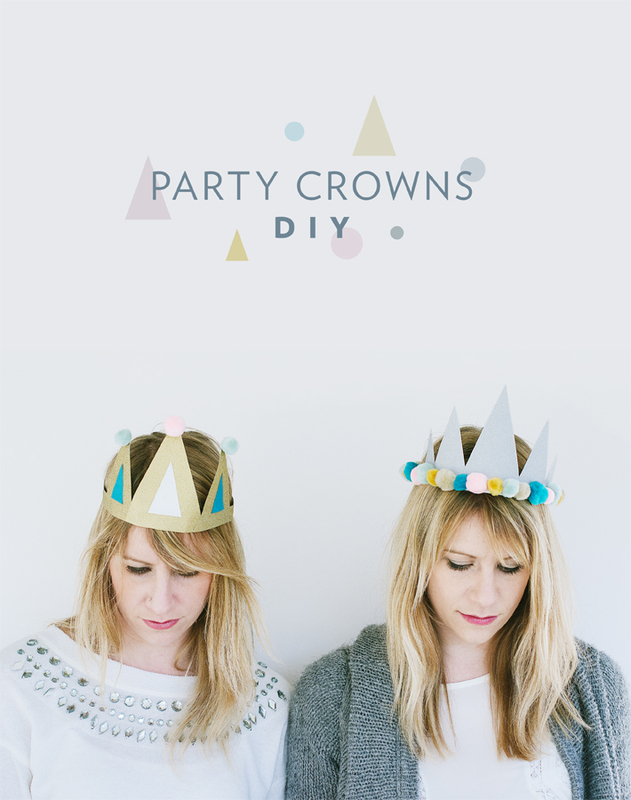 Anyhow, my first post is up today, and I'm sharing how to make gold and silver pom pom birthday party crowns. Check out this birthday crowns post to see more photos and a full tutorial. Also, a special thanks to Jenn Fortner and Michelle Houghton for letting my crafty little crowns grace your gorgeous heads. Is it odd to lust after scissors? If you've ever used the Martha Stewart Fringe Scissors you might think me slightly less crazy. We've been throwing a lot of parties and showers lately, which means a lot of garland. This means tired hands from cutting said garland. After staring at the fringe scissors in the Michael's aisle one too many times, I took my Michael's 40% off coupon (thanks Mom) and finally splurged. And, after using them I can say: worth it. I used the scissors on one of the garlands I came up with for a recent party. I'm not going to say that it's revolutionary as it is another fringe garland. There are plenty of those around the interwebs. But, it is revolutionary in that it was so much quicker to make. And, it's mini. Therefore, I deemed it must be shared. Also, if you have herb scissors they may also do the trick here without having to purchase another item. Or, regular scissors. You may want to pop in a movie for that one. A lot of fringe garlands I have seen call for rolls of crepe paper. I'm not fancy and didn't have any. I'm also not prepared and didn't have time to order any. Instead, I used tissue paper. It caused a few extra steps as far as piecing sections together. But, it's pretty easy if you already have tissue paper on hand. 1. Flatten tissue paper and fold lengthwise to crease. * Cut in half along crease. 2. Take the two new pieces and fold each lengthwise again to crease. Cut each in half along crease. 3. Stack the four long, skinny tissue paper pieces on top of each other. 4. Fold the stack over lengthwise. 4. Take the fringe scissors and cut fringe about two inches into tissue paper. Repeat across until section is fully fringed. 5. Repeat steps 1-4 until desired garland length is achieved. 6. Take each of the fringe sections and piece together by overlapping the fringe sections by about 1-2 inches. Stick double-sided tape on a few of the pieces to get them to adhere to each other. 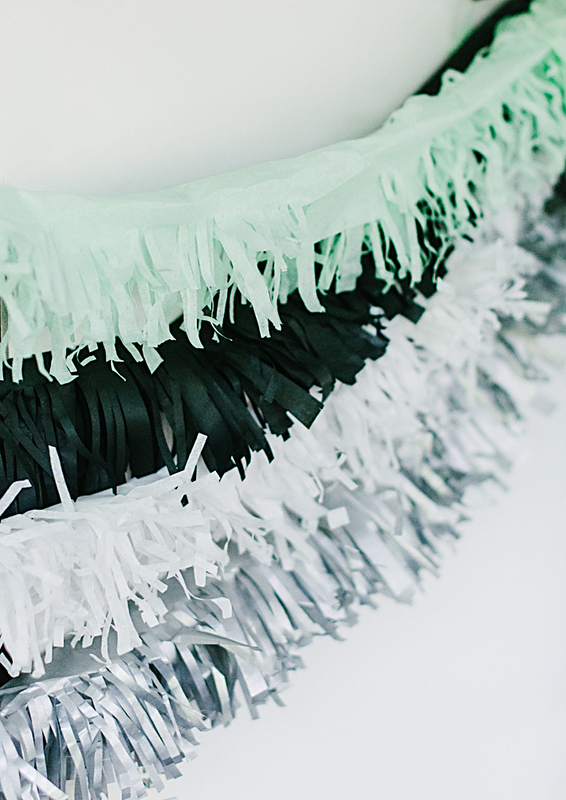 Repeat until all fringe sections make up one long piece of garland. 7. Hang and enjoy your fringe masterpiece. *Once you get good at this, stack the flattened tissue paper in piles before cutting, and it'll go even quicker. I'm not really a glitter girl. I don't sport much of the stuff in day to day life. However, I believe there's a time and place for just about everything. Bachelorette parties, New Year's, birthday parties? Well then, pour me a glass of those sparkly flecks of celebration. My friend Jenn recently gave me an early birthday gift in a glitter bag. The rest of the weekend, I found glitter all over: on my hands, on the seat of my car, etc. It reminded me of her and made me laugh a bit. Today I'm sharing today one of the garland pieces that I made, with glitter ribbon, for my son's birthday party. It turns out that glitter ribbon holds a special place in my lazy/time-strapped heart. That's because the key to making this garland quickly is the stapler. The glitter ribbon hides the staples so you don't have to cover them up. I have bought a surprising amount of the ribbon for the last few parties we've thrown. I may buy stock in glitter ribbon, if such a thing exists. *This is the method I chose, but there are various ways you could cut the circles. You could also trace using a circle stencil, geometry compass or protractor and then simply cut them out with scissors. 1. Cut circles out of cardstock with the circle cutter, or desired method. I wanted large circles so I used the largest circle setting. 2. Cut all circles in half. 3. Cut glitter ribbon to desired length. 4. Place ribbon on top of half circle and staple each end of circle to ribbon. I found it helps to leave a few feet of glitter ribbon on either end of garland for easy hanging. 5. Alternate colors and staple circles about 1-1/2 to 2 inches from one another. 6. Hang and enjoy your glittery circle glory.